In the 1940s, McKee Jungle Gardens was one of Florida's most popular roadside attractions, hosting more than 100,000 tourists each year. 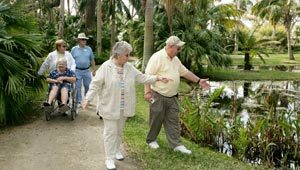 The 80-acre tropical hammock along the Indian River boasted one of the world's outstanding collections of water lilies and orchids in a beautiful setting of streams, ponds, and trails. But by the early 1970s, attendance had dwindled and the garden closed. Most of the land was developed. The Trust for Public Land purchased the remaining 18 acres in a cooperative project with Indian River Land Trust. Reopened to the public in August 2001, the gardens now include a new education building and small cafe, as well as restored poinds, streams, and flower beds.